The most search query I had ever asked Google as blogger was how I can find my blog’s RSS feed uniform resource locator (URL). I can authoritatively tell you only a few blog owners know their blogs RSS feed URL. 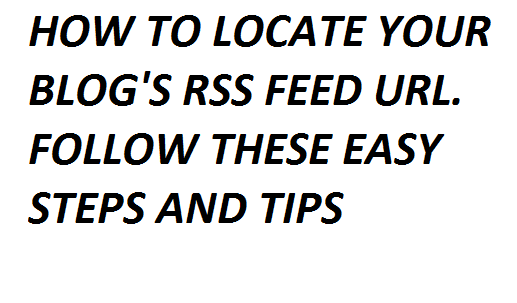 The abbreviation “RSS” stands for really simple syndication but how simple is it when we are asked to provide our blog’s RSS feed URL. One major issue you may face online is when you are asked to submit your blog’s RSS feed URL when submitting your blog to blogging directory or a bookmarking site. The annoying part of this is that you will keep hanging around until you are able to provide your blog’s feed URL, and when you fail to do this your blog wouldn’t get submitted. When you find yourself in a situation like this do not quit, rather look for a means or a way out because submitting your blog to these directories increases your blog visitors and followers. Even as a newbie in blogging, you must have in a way or the other seen your blog’s RSS feed URL unknowingly to you. You don’t really need to be a programmer or website designer before you can locate your site’s RSS feed URL. But don not forget also that your domain name ending with a .com or.org is not your blog’s RSS feed URL. Let me remind you again that if you are trying to increase your blog followers you have to add your blog’s RSS feed URL, though this may not be an easy process but it’s worth the sweat. Your feed URL automatically assists in updating your posts in blogging directories instead of doing this submission yourself whenever you post a new article. Since you now know the importance of your blog’s RSS feed URL, it is time you decide to learn how to figure out where to find it on your blog by paying close attention to the details am about to give you. ð First, go to your blogger dashboard. ð Next, navigate to your blog’s side bar and look for the subscription buttons (orange buttons which are titled posts and comments respectively). Note if these buttons are not on your side bar then you have not added yet, you only have to install them by doing the following: 1, click on posts 2, now a drop down menu will pop down, click on Atom. Since you are on blogger your RSS feed url should be like this http://--blogspot.com/feeds/post/default. But if you have a custom domain it appears this way: http://www.techtimes.com.ng/feeds/posts/default, this is my blog's RSS feed url. ð Next, you have to copy and paste this URL to a safe place or your notepad. STILL HAVING ISSUES LOCATING YOUR RSS feed URL? When you right click Atom, select open link in an incognito window if you are using a Google chrome browser and look at your browsers address bar. The URL you find on the address bar is you blog’s RSS feed URL. Please be aware that enabling the subscription links allow your blog visitors to subscribe to your articles thereby increasing blog readership and followers.